But this madness is no longer contained in the Tainted Lands. It spreads, filling the empty places around it with the dread of horror, polluting the world one small step at a time. This all-in-one Siege Engine Role Playing Game is brought to you by the makers of Castles & Crusades. 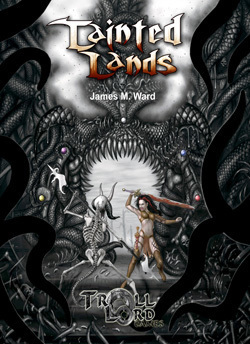 Created and written by famed game designer James M. Ward, Tainted Lands is an RPG of Fantasy Horror. Utilizing the simple Siege mechanic Mr. Ward allows the Game Master to plunge his characters into a world of unrivaled horror where the supernatural dominates the adventure! Upon the far slopes of the Turmberg Mountains, where the northern shores of Lake Vanhir lap the Plains of Cos lie the fog-enshrouded Tainted Lands. In the Days before Days hosts of dark hearted Val-Ehrakun settled here even before the sun and moon rose in the heavens. They shaped the earth, molding it with hysterical delusions. In their delirium they befouling the land, polluted the waters and staining the very air with madness. The land itself, filled with this poison became twisted, a living embodiment of the horror of nightmare. But as with all things, this too passed and the Tainted Lands became a wasteland of forgotten dreams and misspent sorcery. For eons it lay dormant, suffering under the yoke of time. But now, the shroud of its winter has given way and the Tainted Lands have come alive again. The earth groans and spits its necromantic horror in the air. Monsters, dread and foul rise from the muck of corruption and stalk the wastes. And the dreams of gods rise as nightmares from the blasted heath. Nothing good is born in the mists of the Tainted Lands. Those who enter can survive there, some even thrive there, using the nightmare landscape to hide in. But as often as not the very magics that corrupt the lands consume them, they are twisted and driven mad, turning on all those and anything that stand before them. Still others fall into he oblivion and never rise again, their bones soaked into the earth and forgotten by history. It's not enough to leave such things alone and hope for the best. If the festering dread isn't rooted out and destroyed, it will continue to grow and consume the world at large. Only true heroes, or perhaps fools, go through the growing Tainted Portals, knowing if they don't act their people and lands are soon doomed by the corruption. It isn't enough to know that creatures, plants, the land itself is twisted and filled with dread, the wise must learn to control their panic, resisting the staining touch of evil as they explore to find the pools of horrific power. Those who survive their journey into the Tainted Lands come back a little twisted themselves, tainted with the evil of those blasted wastes. Their hair white, and for the observant the look to their eyes that wasn't there before. Come play in the tainted lands and survive the horrors that walk behind you, spring at you from the fogs all around, and grow from minor things into alarming corrupted creatures of awesome power; always hungry for those who accidentally become pulled into a nightmare of creatures and lands filled with horrific death.